Rehoboth Condo 2BR /2BA W/King,1 Mi to Beach,W/Elevator (Sleeps 4)! Welcome to your Rehoboth Beach getaway! Upon entering this 2 BR condo, you will notice the owner’s attention to detail that will make your stay enjoyable. The open floor plan, accentuated by 18’ tile and 9ft. 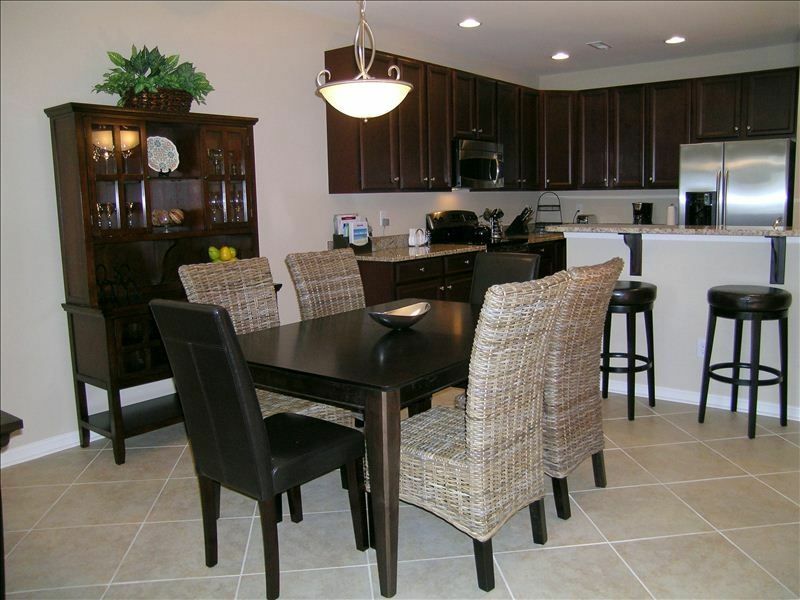 ceilings, features a large granite & stainless Kitchen with an island and bar stools. This cook’s Kitchen has been outfitted with quality kitchen cookware and barware to enjoy your favorite meals. Enjoy your morning coffee or evening cocktail on the balcony. After a day at the beach, chill out on the large sectional and enjoy your favorite shows or DVD’s on the 42” HDTV with expanded Comcast cable and premium channels or listen to some great music on a high-quality IPOD/CD/USB player. The Master Suite is tastefully decorated in spa colors and features a king bed and Master Bath. The 2nd Bedroom offers twin beds, TV and Hall Bath. This serene community offers 2 swimming pools, a tennis court, basketball court, playground, fitness center and elevators. The location of this condo is ideal being on the ocean side of Rt. 1 and approximately 1 mile to the beach and downtown Rehoboth. Located across the street from the Breakwater Junction Trailhead, it is a biker’s or walker’s dream with access to Lewes, Rehoboth, the beach and even some of the outlets. Access to many retail locations is possible without traveling on busy Route 1, saving precious time for the beach and other activities. Beth & Tom are Delaware residents who have been frequent visitors to Rehoboth Beach for many years. There are several reasons why Rehoboth has become ourfavorite getaway. The Delaware beaches that are part of the state park system are undeveloped and have a natural beauty that we have come to love. Rehoboth offers so much more than the typical beach town. It has become a culinary destination that rivals big city cuisine, but yet remains a small, walkable town. We have enjoyed grazing around town and sampling the amazing menus any time of the year. Bike riding is a pleasure here whether it is through old, established neighborhoods or on the newly constructed bike path to Lewes. Lastly, the shopping is abundant with numerous Rt. 1 outlets as well as unique boutiques in downtown Rehoboth. Beth is a licensed realtor in DE & PA. Location! This community is close to all the action including the beach, downtown Rehoboth and Lewes, Rt. 1 shopping and restaurants and the Breakwater Junction Trail, yet is a quiet, peaceful community. We love the open floor plan, large Kitchen and large Master Bedroom. We enjoy sitting on the balcony enjoying morning coffee or an evening cocktial and watching the many species of birds. We are located approximately 1 mile from the boardwalk and ocean on the beach side of Rt. 1(East). Right across the street from condo in complex building, has TVs and bathroom. Equipment includes Treadmill, Elliptical, bike and weight lifting station. Elevator is very close to the unit, maybe 40 steps away from our front door..
Large fridge with in the door water and ice dispenser. Built in, high power unit sits above stove. Nice Square plates, as well as plastics for the the kids, lots of cups and glasses for cold drinks, as well as beer, wine, margarita glasses, etc. Table top Stereo-IPod station, CD & MP3 player (uses dual headset cable connector); not WiFi enabled. Many popular beach read books available; please feel free to take as needed! HDTV, expanded Xfinity cable service including Showtime, Starz and Netflix availability. My family and I recently stayed at Tom and Beth’s condo over the Labor Day Weekend. Tom and Beth are exceptional hosts and go out of their way to take care of you. The condo is in a perfect location, close to outlets, grocery stores, the beach and restaurants. The pictures are true to the décor. It is clean, beautifully decorated, and comes with a well equipped kitchen that will satisfy any self renowned chef/foodie. When visiting Rehoboth, I would definitely book again! Only problem beds were not very comfortable in either room Mattress need updating! Great condo. Modern and convenient to all areas. Would highly recommend! The place was clean and shows that the owners are maintaining the unit really well to impress their clients that to me was outstanding. They will provide u with house rules that to me was a very good thing to have to know which is allowed and not. They have enough supplies for minor things that u may need on a vacation instead of making the trip to a store. It was a great stay for my family and I wish we could go back soon and stay on this unit again. Thank you Tom and Beth! We had a fantastic week at this condo. It is even better-looking than the photos show. The kitchen had everything you need, and the living area was comfortable and clean. Our kids (8 and 10) loved having a TV in their bedroom, too! We enjoyed a cocktail or two on the balcony, overlooking the pond! The pool is great, and is just steps from the door. The location is perfect, easy to get to, but away from Rt 1 traffic. Easy to get to the Rehoboth Boardwalk by driving (you don't need to go on Rt 1), or taking the easy Park & Ride on Shuttle Rd. If you're looking at this condo, book it! You won't regret it. Clean, well stocked, excellent location. Thank you so much for allowing us to stay here. Our stay was so welcoming we didn’t want to leave ! Everything was perfect and it felt just like home ! Payment options: Credit card. Cleaning fee included in rate quote for 3 night or more stays. For 2 night stays an additional $75 cleaning fee added.